Dr. David Bourell is Professor of Mechanical Engineering (ME) and Materials Science and Engineering (MS&E) at The University of Texas at Austin. He is currently the Temple Foundation Professor. Dr. Bourell received his Bachelor's degree in ME from Texas A&M University and M.S. and Ph.D. degrees in MS&E from Stanford University. He was the 2009 recipient of the TMS/MPMD Outstanding Scientist/Engineer Award. Professor Bourell received a Japan Society for Promotion of Science Fellowship in 2006. 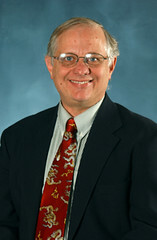 He was the 1999 recipient of the UT College of Engineering Lockheed Martin Award for Excellence in Engineering Teaching. This award is given annually to one faculty member in the College to recognize outstanding teaching. He was elected Fellow of ASM International in 1997 and Fellow of TMS in 2011. In 1991, he was the recipient of a prestigious Alexander von Humboldt Research Fellowship to the Max Planck Institute Powder Metallurgy Research Lab in Stuttgart, Germany. He won the ASM International Bradley Stoughton Award for Outstanding Young Teachers of Metallurgy in 1986. He is internationally recognized in the field of Additive Manufacturing (AM) and is chair of the Organizing Committee of the annual Solid Freeform Fabrication (SFF) Symposium, the leading research conference in the world on this subject. In 2011, he received the International Solid Freeform Fabrication Symposium Freeform and Additive Manufacturing Excellence (FAME) Award, given annually to an outstanding researcher worldwide. Dr. Bourell is also recognized in the area of processing of nanocrystalline powder, materials selection and mechanical metallurgy. He is a member of TMS-AIME, ASM International, the American Powder Metallurgy Institute, the Materials Research Society and the American Ceramic Society. He serves on several technical and administrative committees of TMS, including the Powder Metallurgy Committee and Professional Registration Committee. He is a registered Professional Engineer (Texas). Dr. Bourell's areas of research include particulate processing with emphasis on sintering kinetics, and materials issues associated with Laser Sintering (LS). He holds 14 patents dealing with materials innovations in LS. He has edited or published over 200 books, book chapters, journal articles and conference proceedings.